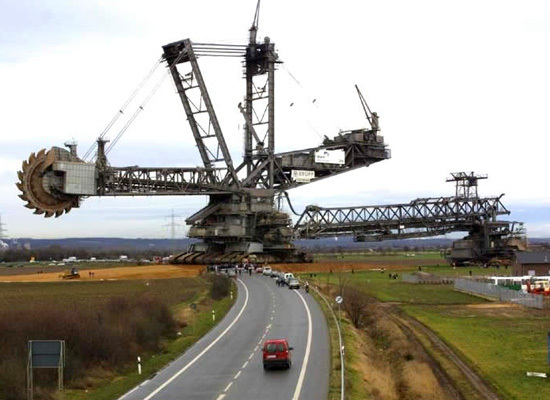 Imagine one of these babies grumbling down new suburbia or ex-urbia, prowling through neighborhoods and cul-de-sacs like an ice cream truck or a horse-driven gypsy caravan selling whatnots and thingabobs, their infectious jingle filling the air, calling out over their loudspeaker: “Get your garden here! Frontyard, backyard, sideyard! Fresh and organic!” The Jardinator©. You pay. They flick some switches, pull some levers and the Jardinator© plops down a garden complete with beds of roses and water features. Or not. Everything's customizable to suit the site's plant hardiness zone or your own peculiar taste in low-maintenance, recycled crushed glass or the prevailing tastes of both Landscape Architecture and Garden Design magazines. At low, low prices. How about a small park? In seconds! A tree-lined Main Street? In nanoseconds! Free samples before you commit. You need at least two of them – fighting. Or with differently angled and shaped digging scoops – bowls, stars, ovals – so that immaculate, unique, and Michael Heizer-embarrassing negative earthworks can be excavated in the blink of an eye. Like crop circles, but Jardinated. The Halliburtonized Nintendoization of Greek myths. ...meets Martha Stewart Omnipedia. Monster trucks planting delicate mums and day lilies. Or the Model T Jardin. From the conveyor belt to showroom floors to homestead. An eccentric Dubai prince, Michael Jackson's best pal perhaps, orders from a catalog, and a Model T Jardin gets DHLed overnight to Kansas. Instant oasis. Paradise by mail. Nice – the world's largest knitting machine. Hook it up and all but interdimensional textiles are looped and threaded in the blink of the eye. Or turn of the rotor. It knits anything: steel, entire buildings, whole forest canopies. Wedding dresses, made of hundred-mile-long cables. It even knits bedrock. Terra Nova. Terra Sculptura. Or bury twenty-five of these things underwater, off the coast of Dubai, and let 'em rip: you could have whitewater high tides for world-class surfing, rafting, fountains galore. The Earth-Fountain: it spits gravel and freshly tilled soil up into the air in dizzying patterns. Synchronized machine-gardening. 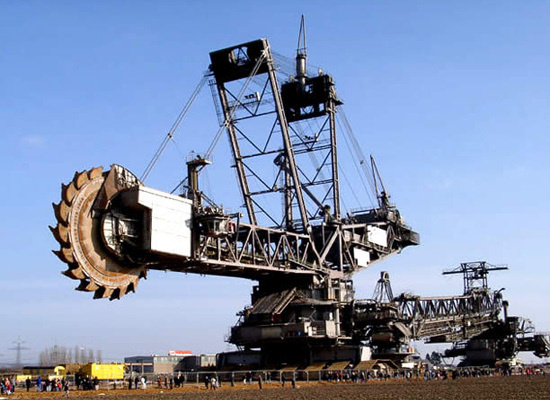 For more images of The Jardinator©, visit the manufacturer's website - ThyssenKrupp Fördertechnik - where you can also see some of their other Olympian mega-machines.